Android is the current competitor of the iPhone iOS. The little green robot and mascot Andru the Android appears as a prominent figure, one of the most fundamental figures in the development of technologies related to mobile devices. In this incarnation, Andru the Android becomes a vibrantly colored green portable USB phone charger that looks more like a toy rather than an actual charger. 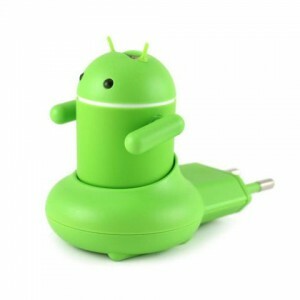 The Andru Android Robot USB Travel Charger displays the Android robot as a sort of pod that seems to be ready to take off into space. The thrusters of the adapter act as its plug, and the accessory’s cute design is obviously aimed at pleasing and attracting Android phones fanatics to buy it and keep it as an essential part of their everyday carry. 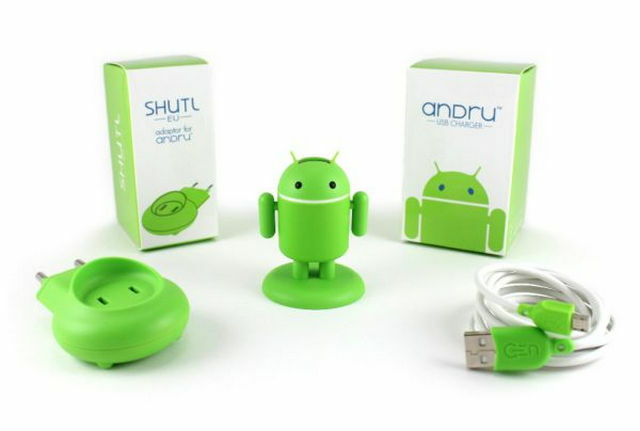 Aside from its pleasing rendering of the Andru Android that serves as the marker of Android phones, the Andru Android Robot USB Travel Charger also appeals in the way it was designed. The exterior material that covers the charger is made from soft rubberlike material and even includes flexi antennae and movable arms. The Android Travel Charger even comes with a stand that keeps the charger up right when not in use. Further evidence of careful design is found in the eyes of Andru Android. His eyes serve as an LED light indicator that tells you when your device is being charged by the phone charger. Other notable features about the USB phone travel charger is that it comes bundled with a micro-USB connector. The Andru Android Robot USB Phone Travel Charger comes from the company Gen and will be introduced to, for now, just the United Kingdom and European Union market. Since, there are not yet any offers aimed at the U.S. market, it would be a safe suggestion that if you were to want one right now, then you would have to get the packaged shipped from the UK or the EU to the U.S. for a special fee. The Gen Andru Android Robot USB Phone Travel Charger costs roughly $33. If you or a friend is interested in collecting or owning kitschy accessories, then you might want to consider this Gen USB travel phone charger. At least, this charger serves not only as a vibrant, cartoony fixture or topic of conversation, but also a practical device that keeps you from being constantly on the lookout for a wall socket to plug your Android phone into. This entry was posted in USB Charger and tagged android robot, Andru, travel charger, USB, USB charger. Bookmark the permalink.